Chicken dinner, meet pizza night. Chicken sautéed until golden brown and baked with marinara sauce, gooey mozzarella cheese, spicy pepperoni and fresh basil. For the sake of clarity and because I really, really like you guys, I want to acknowledge that this title might be a little misleading. 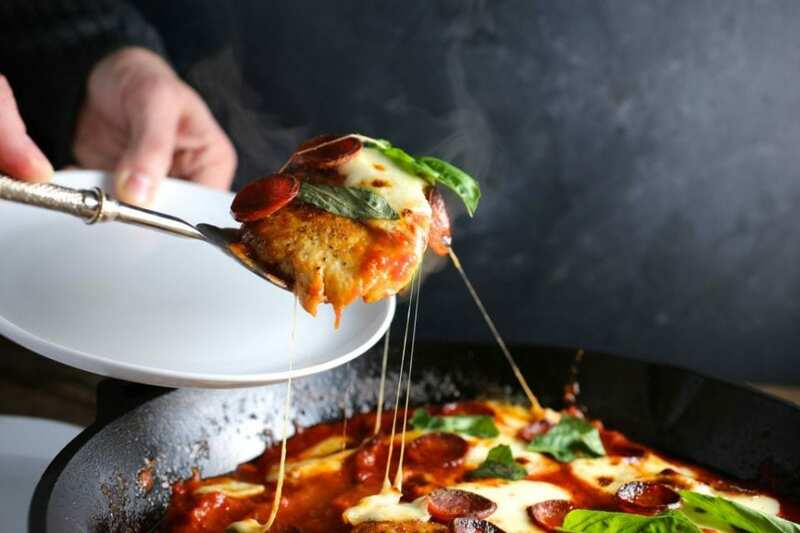 Say you were googling “chicken pizza,” this post might show up (probably on page 35, but whatevs) and I wouldn’t want you to get halfway through reading it before you realized that this recipe is not, in fact, for pizza with chicken on top of it. 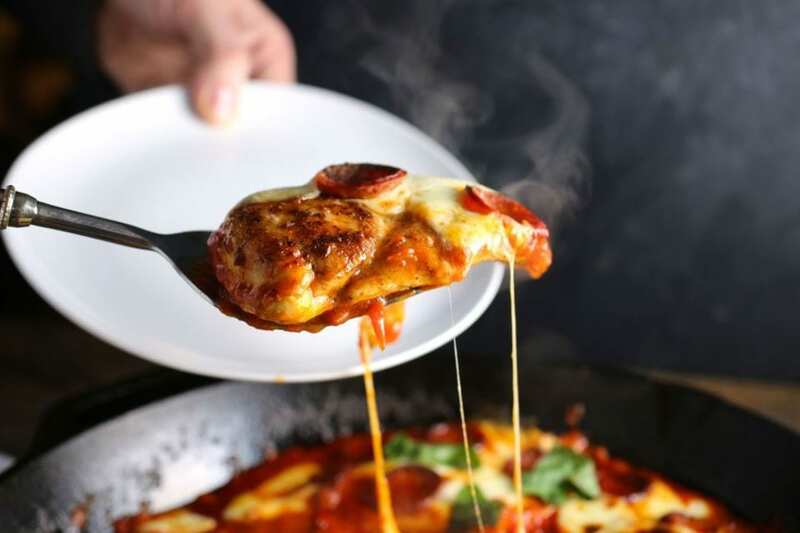 This recipe is for chicken cooked in the style of a pizza. And it’s frigging delicious. It’s cheesy and salty and tangy. Exactly the flavors your tongue expects when your brain has told it you’re having pizza for dinner. It also happens to be gluten free and ready in about 20 minutes. 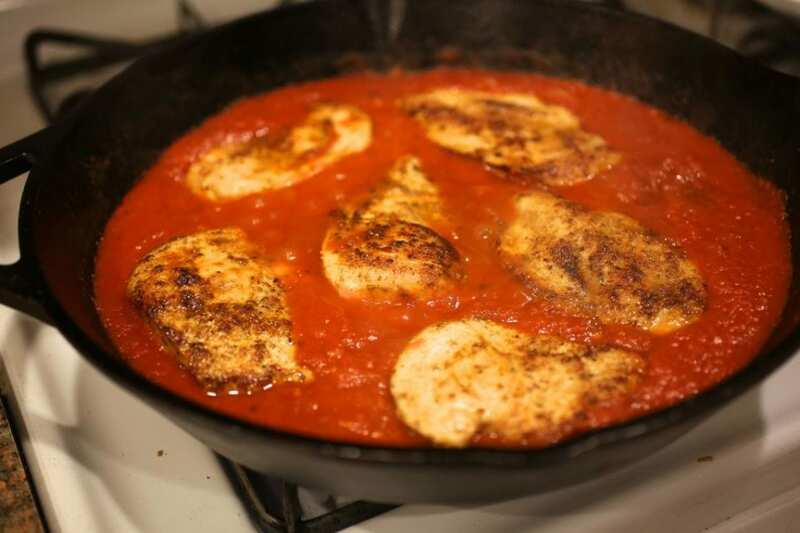 I was inspired by Melissa Clark’s recipe for Skillet Chicken with Tomatoes, Pancetta and Mozzarella. Like everything she makes, it sounded amazing but I was in the mood for something more distinctly pizza-like. 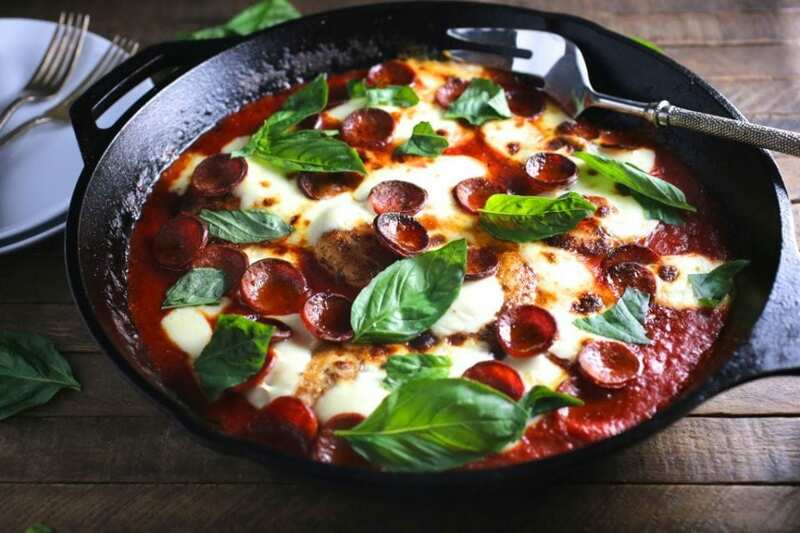 So I sliced up a few chicken breasts, browned them and simmered them in a tangy, garlicky tomato sauce and topped the whole thing with bubbly mozzarella cheese, good pepperoni and lots of fresh basil. Nestle chicken back in the sauce, top with cheese and pepperoni, then broil until bubbly and brown. 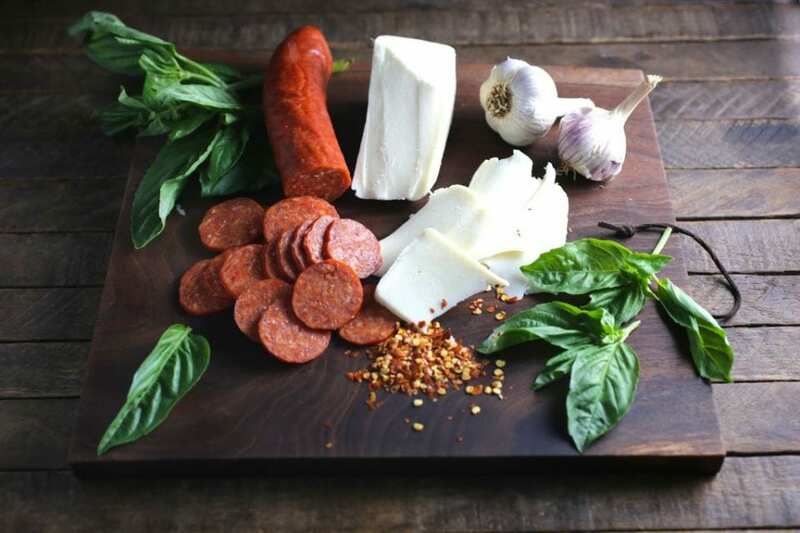 You’re gonna want a pizza this. The result is an easy, quick, one-pan meal that’s healthier than take-out pizza and much more delicious. Bone-in skin-on breasts or thighs would work too. Just brown the skin well and bake it for longer, probably about 30 minutes, before topping with the cheese and pepperoni. I love fresh mozzarella but it leeches a lot of liquid when cooked, so the drier (packaged) mozzarella is my favorite for this. Bocconcini (little balls of fresh mozzarella) work great too. 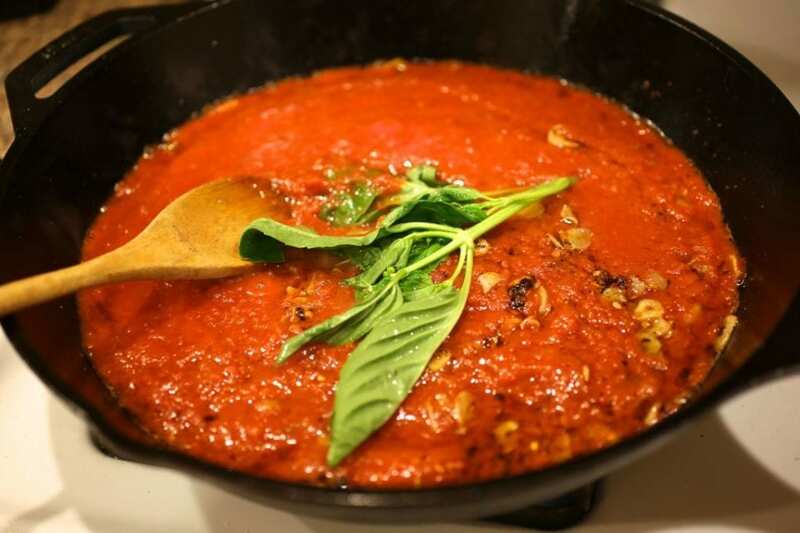 I’ve never had a problem cooking tomato sauce in a cast-iron skillet but make sure it’s well-seasoned and season it again when you’re done. 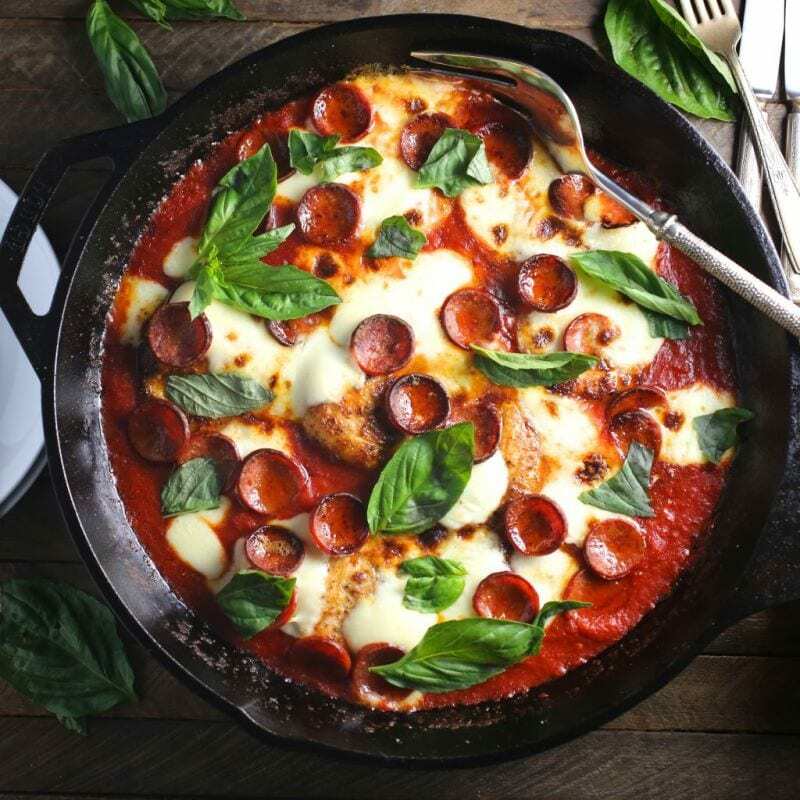 If you don’t have an oven-proof skillet, transfer the chicken and sauce into a baking dish, top with the cheese and pepperoni and broil. A good jarred sauce is a great way to make this dish even faster. Heat oven to broil on high. 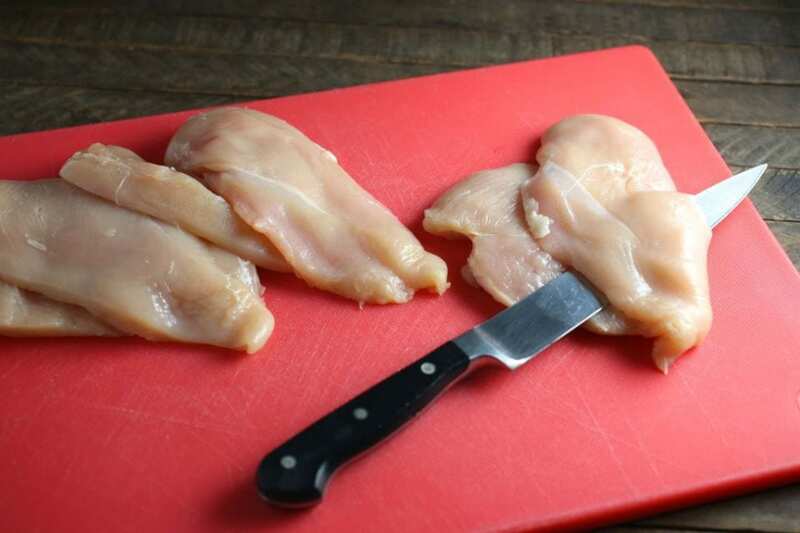 If using whole breasts (not cutlets), cut them in half to make them thinner. Pat chicken dry and season with salt and pepper. In a large oven-proof skillet, heat oil and butter over medium-high. Add chicken in a single layer and sear until well browned on both sides and just cooked through, about 10 minutes total. Cook in batches if necessary. Transfer to a large plate. To the same pan, add garlic, anchovy and red pepper flakes, sauté 1 minute. Stir in tomatoes and basil. Cook until sauce thickens a bit, about 5 minutes. 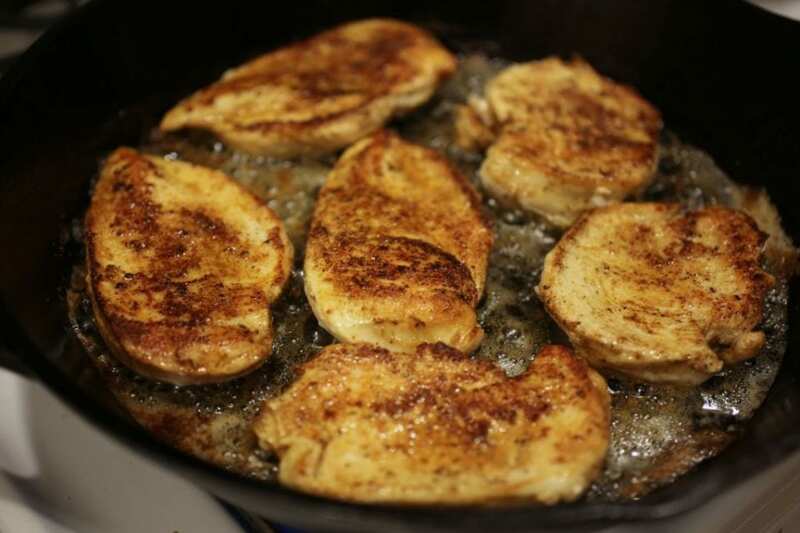 Return chicken to skillet. overlapping as little as possible. Top each cutlet with some mozzarella and pepperoni. 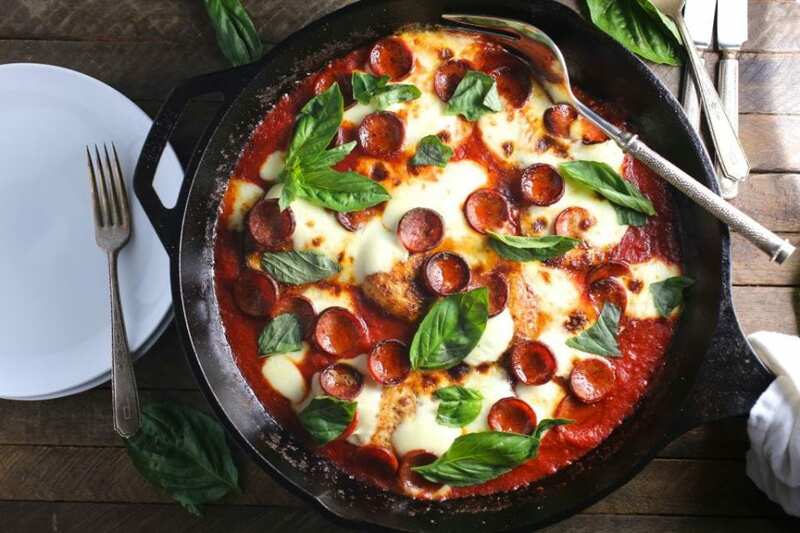 Place skillet in oven and broil until cheese is melted and bubbling and pepperoni is a slightly browned, 2 to 3 minutes (watch carefully to make sure it doesn't burn). Garnish with chopped basil before serving. Great ideas! I was definitely thinking about doing mushrooms, ricotta, pesto when our basil grows back. Thank you so much for the compliment! Ohhhhhh man this looks good. I actually don’t like chicken on top of pizza, but pizza on top of chicken sounds totally fantastic. Gorgeous photos as well. This reminds of shakshuka too, but with pizza mixed in! Loved this recipe! I had some onion and mushrooms kicking around so added them at step 4. Served it over a bed of spaghetti so it was like a pizzaghetti!